There lived a house wife in some part of Karnataka with her husband, kids, in-laws and other family members. Every morning, be it on weekday or weekend, she would get up early before the golden sun rays caressed the mother earth. With pearls of water adorning her long curly hair and the diamond studded nose ring sparkling from the golden glow of Diyas she entered her humble kitchen to prepare breakfast for her whole family. She had to prepare something which all her family members enjoyed and it was not an easy thing to achieve. To make the matters worse it was month end and there wasn’t many vegetables left in her kitchen pantry to cook with. She wished it was a bad dream and she just have to close her eyes for a second and open to see an array of baskets filled with vegetables which all her family members liked. 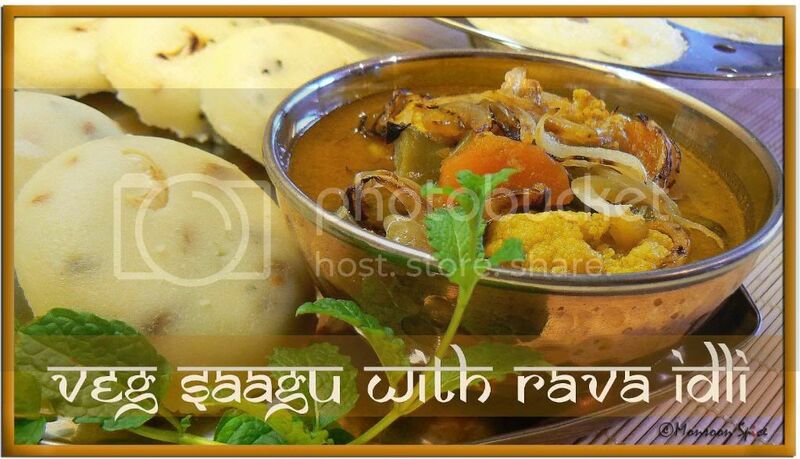 Vegetable Saagu is a classic Kannadiga dish. Visit any of the Darshini hotels or Dosa corners and you are sure to see Vegetable Saagu as their signature dish. Just visit any Kannadiga home at breakfast time and the probability of finding Saagu for breakfast is very high. And why not? It is one of the delicious blends of spices with sweet coconut which is sure to show its magic on any vegetables it touches. The leftover vegetables at the weekend or month end dazzle with flavour and aroma and are not less worthy than any other exotic dish. Here is my Amma’s signature Vegetable Saagu recipe which I treasure a lot. It is full of flavours and scores high when it comes to taste department. And I love it more the next day. So don’t forget to make extra batch of Saagu which is sure to blow you away when you taste it next day. I just love the aroma of Saagu which lingers for hours on my finger tips and can’t help but feel hungry again in spite of having it just few minutes back. Cook vegetables with turmeric powder and salt to taste in a pan or pressure cook till they are fork tender. While the vegetables are cooking, dry roast all the spices (cinnamon, cardamom, cloves, coriander seeds, jeera, dry red chillies) for 1-2 minutes on a medium to low heat till nice aroma appears. Grind these spices with coconut, soaked rice, poppy seeds, coriander leaves, and green chillies, if using any, to a smooth paste adding very little water. Mix this ground paste with cooked vegetables. Add jaggary and adjust the seasoning and let it cook on a medium flame for 15-20 minutes for all the flavours to blend well. While the Saagu is cooking, heat oil in a pan and add mustard seeds. When the mustard starts to pop and splutter, add curry leaves and hing. Sauté it for few seconds and add thinly sliced onion. Saute it on a medium flame for about 5-10 minutes till it turns golden brown. Remove Saagu from fire and mix browned onions and coriander leaves. Cover and let it sit for 10-15 minutes for the flavours to blend well. Serve hot Saagu with Poori, Chapatti, Dosa, Idli or with steaming Rice and enjoy. It tastes better the next day. Love the stories you tell Sia,I am never going to forget the story behind the Saagu ;) This is probably what is called Kurma in TamilNadu yes the heady mixture of coconut, spices and vegetables is hard to resist. Looks lovely. Namaste London! :D Hey thats a very lovely story, the saagu looks very tasty,with those fried onions! Same pinch, indeed for rava idlis!Wd surely try out your lovely Saagu! WoW....a lovely recipe & it was wonderful reading the background description...Its really mouth-watering...will try this recipe in the weekend....Wonderful! I loved the story. I love your pictures too, they are so beautiful. Never had sagu, but looks delicious. Lovely to read it all Sia. I never tried Saagu , yours one is too tempting . A feast for eyes. thanks a lot for sharing Sia. P.s.-Got your email with entry buddy, thanks a lot, hugs to you . Hope K is all fine now. I *adore your writing Sia. I have some odd veges lying around. Thanks for the inspiration. BEAUTIFUl story! i could almost imagine MOM inventing some lovely dish :). Hugs to you, Sups, for such beautiful creations. Rave idli and saagu do go so well together :). You know my love for rava ;). you are one great story teller! and a fabulous photographer too! Love the pics of your Saagu spices! Kudos girl! And thanks for reminding me about saagu! Had it last week at our SIL's house -with regular idlis! Gosh, haven' had rava idli's in ages. Hope your travel plans are going well. Love the story and of course the saagu. Yummy recipe. thanks. Wow...I am drooling and salivating...I love sagu in all its forms. I am going to try this. Loved the story and the suspense that followed. I loved the Puri, Saagu made in restaurants etc, but I can never make a decent one. One question though, I see corriander seeds in the picture for 'Saagu spices', but it is not mentioned in the masala list. How much corriander seeds do you add? Thanks for the other links as well. oh wow!! Saagu looks yummy!! And you said it right Sups.... Its everyones fav dish in k'taka!! the pic with all the roasted spices is fab!! lovely recipe. i've had something similar with soaked moong dal thrown in. it ads good texture and flavour. 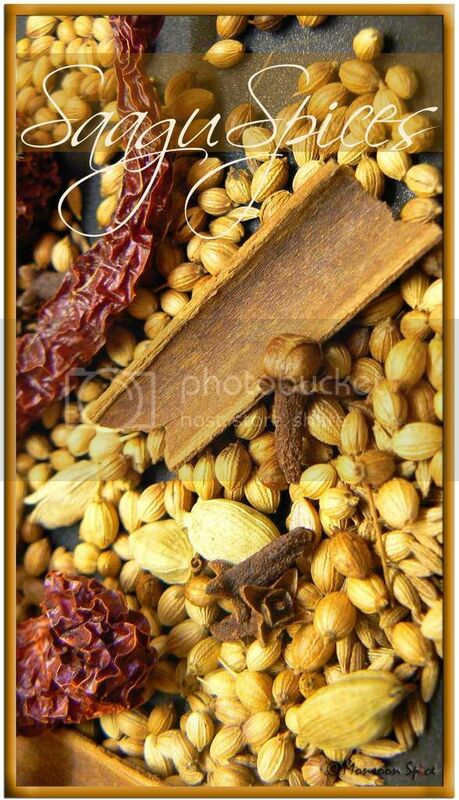 That's a gorgeous pic of the roasted spices, Sia! I am a big big fan of Idli and I do feel that idli with sambhar is boring sometimes...... so it's gonna be sagu next time!! Sia, I thoroughly enjoyed reading the saga. Well written. Gorgeous pics, tempting the reader to try them straight away. I thoroughly enjoy reading your posts dear Sia, it always takes me back in time :) Love the Saagu and the recipe...like the Eggplant curry, the saagu too has its own versions in every household. Amazing pics!! Lovely picture of the spices! Nice story too! And ofcourse saagu is a favorite in my home! I have to try this..as i have never tried saagu sia..
hv a good wknd sweetie! Sia.. Today i came to knw the origin of Saagu :) !! Lovely story with wonderful saagu !! Guess What?? Me being a kannadiga, never tried it :( !! Bit lazy to make it, becoz lengthy procedure :)!! I always wanted to try but keep postponing it !! but this time I vil ur version.. :D !! I LOVE this recipe. By the way, you have just reminded me of the event. Eeeeek. Better get cooking! This is awesome !! !excellent pics and recipe ....I will surely try this soon!!! Modhalane sari Kannadavara Aduge website nodi kushi hayithu. 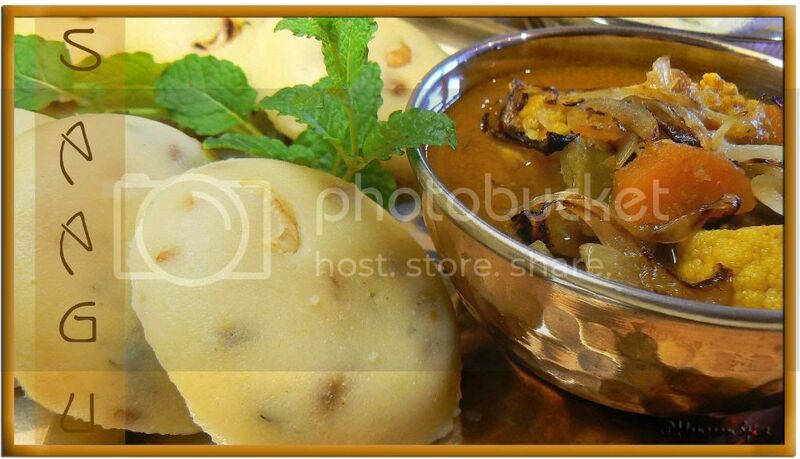 Tumba kushi hayithu modalabari kannada cooking recipe website nodi.